Are you looking for a healthy recipe to bring to a holiday gathering? 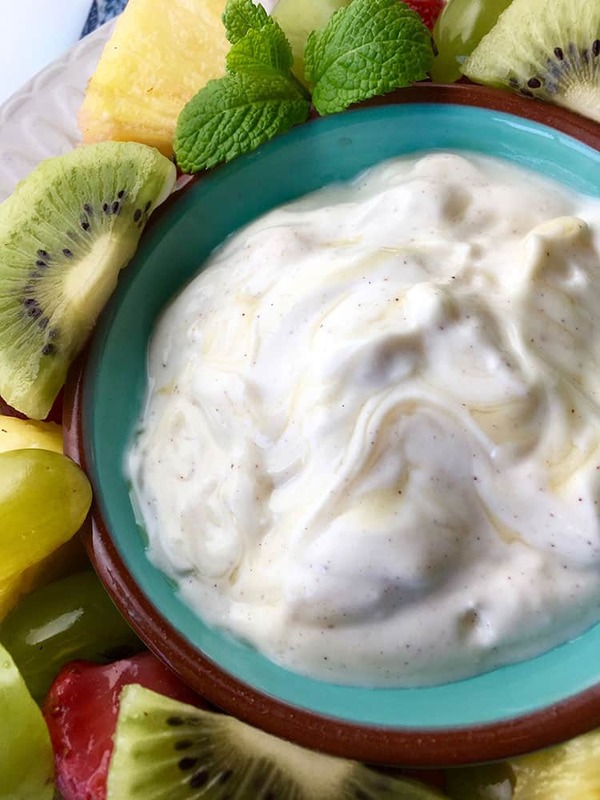 A fruit platter or fruit salad with this Honey Yogurt Dip is always a hit. Whether you make this Fresh Fruit Salad for a party or you’re making it to serve at home, everyone who tries it sings it’s praises. The wow factor of this simple flavorful fruit salad is the addition of Cotton Candy® grapes. This newer, super sweet variety delivers a very distinctive flavor worthy of its memory-invoking name. If you haven’t taken a bite out of Cotton Candy® grapes, you’re missing out. They are lip smacking good! Another note, in order to get the best presentation that our yummy fruit salad deserves, don’t add the strawberries to the salad until right before serving. If you add the strawberries in earlier, the rest of the fruit will start to absorb the bright red color of the strawberries. To prevent browning, slice and add kiwi to the bowl right before serving, as well. If you love serving fresh fruits as much as we do, you might also enjoy our yummy fruit kabobs and our Chocolate Fruit Pizza Recipe. When you get busy with life, sometimes it’s easy to forget about making sure that you get enough fruits and vegetables into your diet. Recipes like fruit salad, and fruit desserts can make it easier to include delicious and nutritious foods back into your diet. Note: Cotton Candy® grapes are not a genetically modified food. Instead, their wonderful taste is the result of selective natural cross-breeding practices conducted over many years. When you have family or friends over for a party, there are always a few essential dishes that should be prepared. You’ll typically see a vegetable plate with a cold ranch dip, chips with a hot dip like Chicken Buffalo Dip, and fruit with a dip. 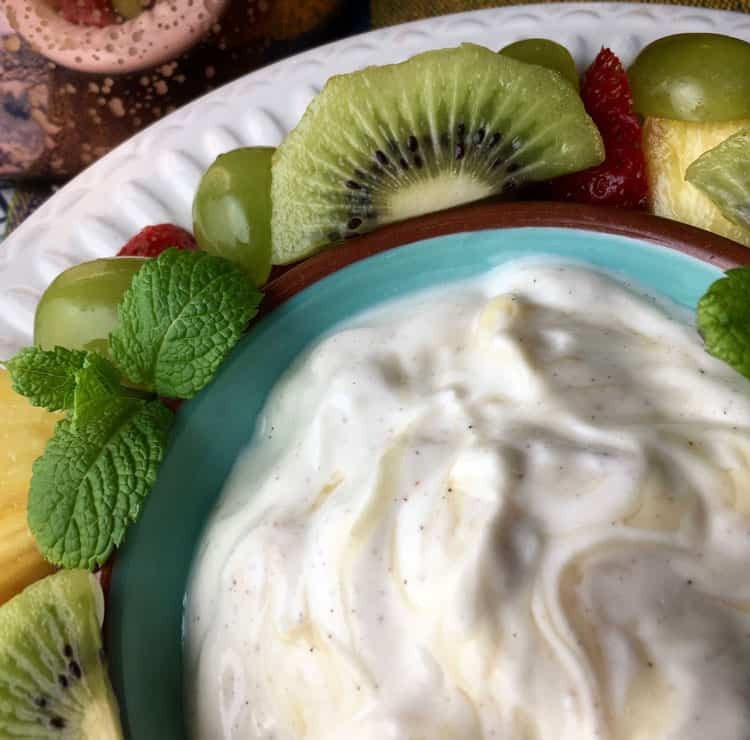 In the past we’ve made this yummy Cinnamon Fruit Dip, which everyone really loved. We’ve also made a strawberry fluff fruit dip, which was quite delicious. People tend to like to stand around the kitchen snacking at parties and other gatherings, so it is always a great idea to have a simple variety of food on hand that is know to be people-pleasing. Another idea would be to have a relish tray. This can be as simple or as complex as you’d like it to be. Relish trays could include homemade pickled peppers, olives, pickles and the like. You could also serve a simple tray with cheese and crackers. If you’re putting a little bit more time into party preparations and want to serve a couple hot appetizers, our Stuffed Mushrooms literally always receive rave reviews. Prosciutto Wrapped Asparagus is another delicious option. Any party that includes kids should have a fruit platter or a fruit salad. Think about it. We’re busy trying to teach our kids to eat healthy and make healthy food choices. And the amazing thing is, when there is fruit readily available, kids will gravitate towards it because it is sweet and tastes good. 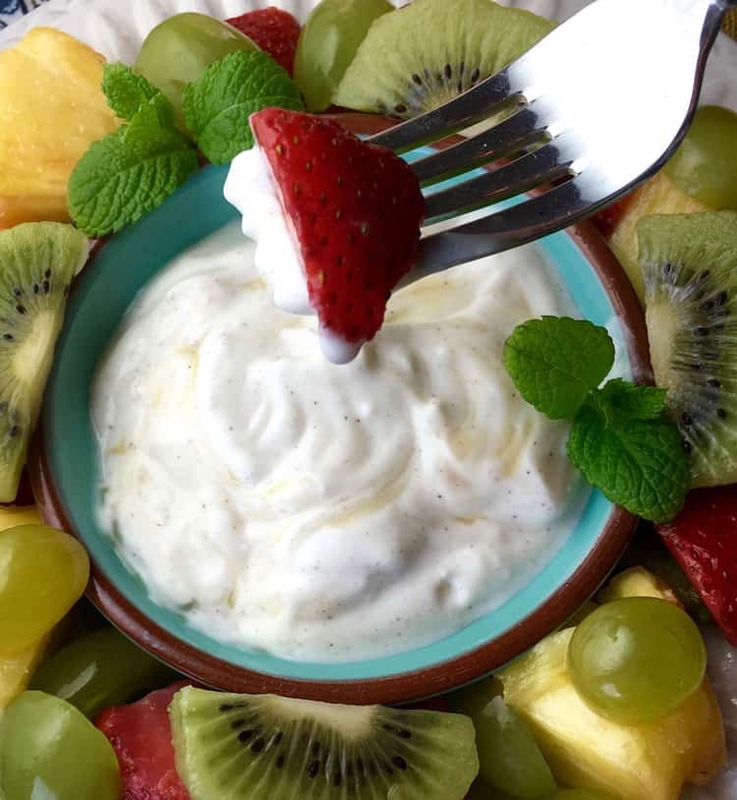 Enjoy this easy fresh fruit salad with honey yogurt dip. Perfect for a snack or party food. Prepare yogurt dip by combining all ingredients in a medium bowl. Cover and place in refrigerator until ready to use. To assemble fruit salad, combine prepared grapes, pineapple, and mango in a large glass or other non-reactive bowl. Add pineapple juice, lime zest and juice, and mint to bowl and toss to combine. For additional sweetness, drizzle mixture with honey and gently stir to combine, if desired. Chill fruit mixture in refrigerator for at least one hour. Place prepared strawberries in a separate container to chill at the same time. 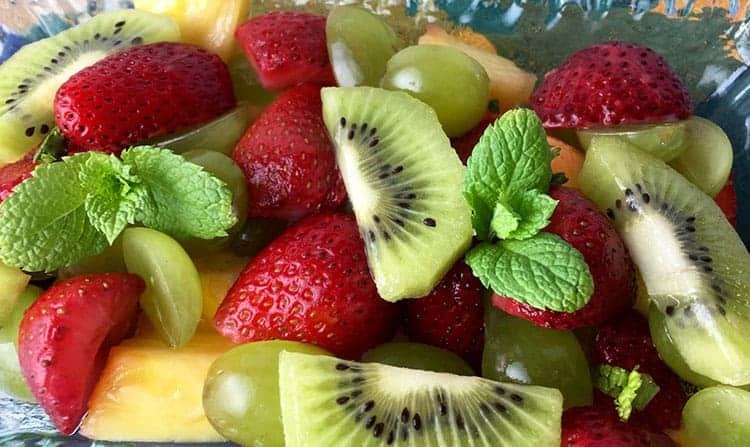 Once chilled, remove fruit salad and strawberries from refrigerator and add strawberries and freshly sliced kiwi to the bowl. Gently stir to combine and serve immediately with honey-yogurt dip. Yes, think it’s good when we look fresh fruit and yogurt. Maybe, I will make it on my daughter’s birthday.